Final Black Friday Gift Card Giveaway Winner – I Had SO Much Fun! I had the BEST day – you guys made the hours fly by! I will be quitting very soon for the night but didn’t want to forget to give away the last gift card. I wish I could’ve given one to all of you! The last Black Friday Gift Card Giveaway Winner is…Colleen Reed! You’ve won a $50 Amazon eGift card! Will you please contact me directly at info@freebiesforacause.com to claim your prize by 4:20pm CT.
Just because this is over, doesn’t mean the fun has to stop. Don’t forget to enter my BIG beauty giveaway ending next week! Good luck! Okay, I’ve had a few VERY short naps and I’m ready to finish this day with a bang! The second Black Friday Gift Card Giveaway Winner is…Aline Abbott! You’ve won a $10 Amazon eGift card! Will you please contact me directly at info@freebiesforacause.com to claim your prize by 2:45pm CT.
Today only, from 7 am CT until 4 pm CT, comment away and you can enter to win Amazon gift cards! Interact with me on Facebook; Like and retweet my Twitter posts plus leave me comments on the blog. Every time you do that, your name gets added to the list again. There is no limit to the number of entries you can earn. Randomly throughout the day, I’ll be announcing winners of Amazon gift cards ranging from $5 – $50. Once your name is announced, you’ll have one hour (exactly) to contact me. Ready for some fun? Anyone else need a nap yet? The second Black Friday Gift Card Giveaway Winner is…Karen Evans! You’ve won a $20 Amazon eGift card! Will you please contact me directly at info@freebiesforacause.com to claim your prize by 11:40am CT. The First Black Friday Gift Card Giveaway Winner is…. The very first Black Friday Gift Card Giveaway Winner is…Jeni Harwell! You’ve won a $10 Amazon eGift card! Will you please contact me directly at info@freebiesforacause.com to claim your prize by 10:10am CT.
Black Friday Giveaway Starts NOW! Win Amazon Gift Cards! 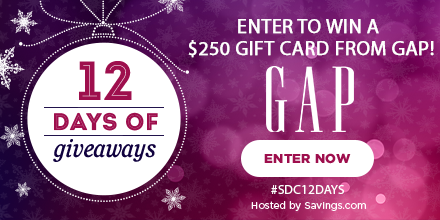 Today only, head to Savings.com where you can Enter to Win a $250 Gap Gift Card! Good luck! Good Housekeeping’s 2017 Toy Awards Sweepstakes – chance to Win $1,277 in Toys from the Good Housekeeping’s 2017 Toy Awards through November 27th. Bimbo Bakeries USA Ball Park Buns TailGreat! Sweepstakes – chance to Win a Tailgating prize pack that includes Ball Park buns for a year, Yeti cooler and Big Green Egg. Plus 5 will also win Yeti tumblers, koozie, frisbee and wireless speaker through November 27th. AND don’t forget to enter my BIG Beauty Giveaway!!! Today only, head to Savings.com and enter to win a $250 Old Navy Gift Card. Good luck! It’s time to treat yourself! How would you like to win a Cricut Maker Machine ($400), a Brother Embroidery and Sewing Machine ($390) or any of 18 other prizes? The awesome Ultimate Bundles team is running a giveaway…and not just any giveaway! So take two minutes and head here. You’ll pick your category, and enter your name and email address. That’s it! Good luck! Today only, head to Savings.com and enter to win a $250 gift card from Home Depot! Good luck!